Marrakech is a manic and magical place. You will find times when you just want escape the madness then you find yourself almost alone enjoying some peace and tranquillity. Interestingly these moments can be only a few footsteps away from each other. 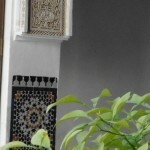 Our first piece of advice would be to choose your hotel/hostel/Riad carefully. You want to be somewhere close to the action but not so close that every time you step outside you are bombarded with ‘Hello, look in my shop’ or assailed by the noises of the Jemaa-el-Fha Square that never seems to sleep. 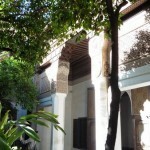 Our Riad Dar Noukas, was on the edge of the Medina so the area was generally quiet. We were celebrating our 25th Wedding Anniversary so paid a bit more than we usually do but it was well worth it. The rooms were really nice and comfortable, the breakfasts were amazing with something different each day. We also spent one afternoon sitting upstairs reading in the sun, they have sun lounges and day beds to chill on, it was very quiet as well. It was close enough to walk to many of the sights so we walked everywhere including the 3kms to Jardin Marjorelle. 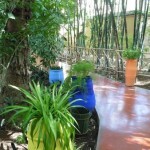 Jardin Marjorelle were designed by artist Jacques Marjoral on land he acquired in 1924. Found in disrepair by Yves St Laurent, he purchased it and renovated it to what we see today. 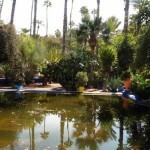 The gardens are one of the most visited sights in Morocco and after visiting I can see why. The shadowed paths flanked by palms and a huge variety of cactus’s make it quite unique. 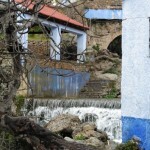 The use of the colours blue, yellow and orange along with water features give the gardens a true feeling of tranquillity. When you are inside you feel a thousand miles away from the noise and hustle of the city. Also inside is a Berber Museum, this displayed artefacts of the traditional tribes of Morocco. While it is small it is laid out in a way that you feel it is a much larger space. Clothing, tools and the stunning jewellery are all displayed for you to view along with explanation cards with more detail. The cost of entry for the Gardens is 50 dirham (dh) and the museum is 25 dh. While this is quite expensive compared to the entry of many places in Morocco we felt it was well worth the money. If you are interested in Moroccan and Islamic architecture (or even just looking a beautiful buildings) Palace Bahia is a wonderful place to visit. It was built in the late 1900s and is set in 2 acres of gardens although we did not see much of the gardens as there did not seem a way to access them. However, you can wander around this amazing palace, imagining how life was back when it was used to house the King and all his wives. 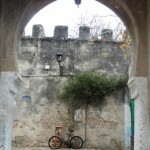 It is a maze of buildings built around courtyards with water features and gardens in them. The ornate plasterwork decorating the doorways and archways with amazing patterns. The ceilings are painted with beautiful designs in blues and reds as well which add to the beauty of it. Entry is 10 dh but If you are interested in the history of the Palace you can also employ a guide to show you around and explain everything in context for an extra charge. 10 dh (again you can pay extra for a guide if you chose). We wandered in through the narrow passageway which suddenly opened up to a smallish area surrounded by a couple of terracotta buildings, inside were tiled grave stones, some with marble carved toppers. 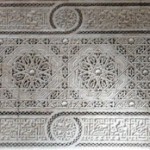 The inside of the buildings were decorated similar to the Palace ornate ceilings and carved plaster archways, these house the graves of Sultan Ahmed-al-Mansur and his family from around 1600. These building were also surrounded by other tiled graves where the servants and soldiers were buried in the gardens. It was quite beautiful but personally I wouldn’t bother going unless you had a real interest in that dynasty. You can’t go to Marrackech and not visit the mayhem that is Jemaa-el-Fha Square. You can buy anything there from orange juice freshly squeezed as you watch or an Iphone 6 from a passing salesman (not sure how legitimate they are though). The real entertainment is the snake charmers, busking bands, monkeys dressed up and a number of others who entice you over to take a photo then put their hands out for payment. They try for 100dh and look disappointed when you give them 10 but in reality there are thousands who pass through the square daily, if even half give them 10dh they are making a good living. Just make sure you have plenty of change when you go, sit down and watch the shows if you can get close enough and enjoy the chaos. If this is too confronting for you there are a number of coffee and icecream shops that have balconies where you can buy a drink and sit and watch it unfold below. Once you know their tricks you can see the performer looking for a ‘victim’ and walk towards them, it is funny when it isn’t you . In the evening the square is filled with food stalls, joining the nut and orange juice sellers calling you to eat at their stall. We found a couple of really good places to escape the mayhem and enjoy a good meal for a reasonable price. La Port Du Marrakech at Toualet Kennaria 68 offers a three course meal for 60dh. The meals were excellent and the service was really good as well. We ate here twice while we were there. The other place was the Marrakech Henna Art Café, we felt so welcomed here, the waiter was so friendly and happy we intended only having a drink and spent so long ended up having lunch. The meals were delicious and a reasonable cost. You can also have a henna done here if you want, maybe a bit safer than the ones in the square as you never know the quality of what they use. The café also houses local art along with special exhibitions so if you like art it is also worth a look. 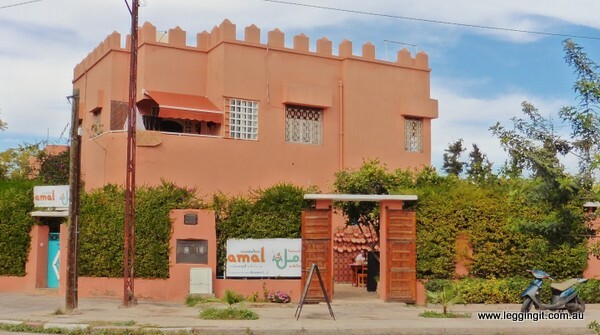 The final place I wanted to tell you about is restaurant Amal, a not for profit organisation. They train women who come from disadvantaged backgrounds so they have employable skills. We spent a lovely lunchtime there, the food and service were excellent and the prices were really good too. You can also do cooking lessons, people who were staying at the Riad did one of their courses and were really impressed. It was good value at about 200dh per head which included lunch, desert, coffee and tea. While we spent our time doing quite relaxing things Marrakech is also a hub to do many things like quad bike, horse or camel riding and day trips to the Atlas Mountains so if you are wanting an adrenaline rush there is plenty to choose from as well. So that is our list of things to see in Marakech. Have you been? Can you add anything? Thanks for sharing these tips! I am going to Marrakech for the first time at the end of March with my family (and then we are hiking in the Atlas mountains for four days)–I cannot wait! Morocco certainly sounds very intriguing. I’d like to add it to our itinerary when we get to Europe, even if it was only for a week or two. I was just talking with a friend about planning a trip to Morocco and Marrakesh. These tips are perfect timing. This is great as we’re going to Marrakech for the first time in May! Enjoy your trip I hope you like it as much as we did. Michele, thank you so much for your kind comments about our cafe. You are right about our henna being safer than what you might find in the square-some artists there use “black henna” which is a chemical dye that some people have severe reactions to. No matter where you get your henna, make sure that like us, the artist uses only 100% natural henna. 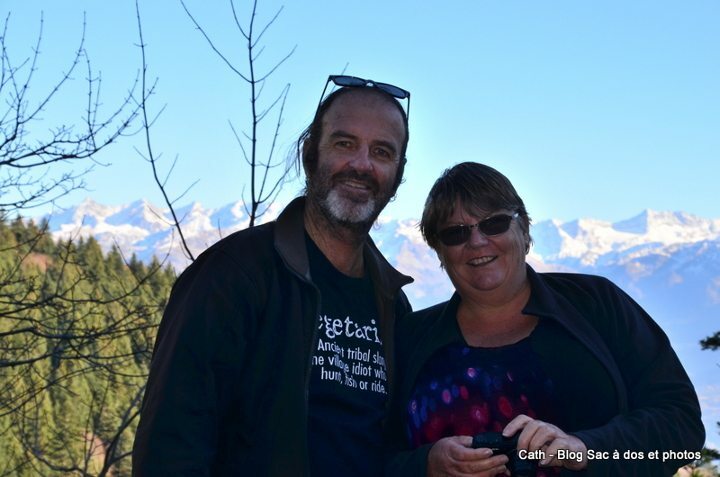 Thanks for visiting us, and we wish you both happy travels-and happy anniversary! Lori and Rachid, Marrakech Henna Art Cafe. Thanks Lori we did wonder as there have been issues with this in Bali so were guessing it might be the same. We had a lovely time in Marrakech and hope to return before we leave Morocco. 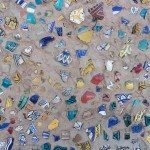 I enjoyed learning a bit about Marrakech through your post. Manic and magical seem apt descriptions. Glad you enjoyed it Donna, it is such a diverse place to visit. 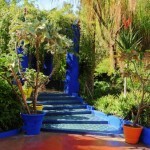 We have only been to Tangier, but since then we have wanted to explore Morroco further, especially Marrakech. Great tips for when we do. I would love to try a cooking class there. Me too I m hoping to do one in Essaouira while we are here. I love learning new ways of cooking. 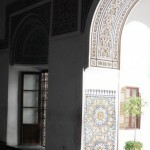 That was a smart choice with the riad and I agree, it can be exciting and also madness in the city especially around the Medina – finding a quiet corner to relax is key to enjoying this bustling city. I appreciated the advice about choosing where to stay to catch some relief from the touts and hucksters. Marrakech has such an exotic reputation. Like you, I’ve been intrigued by the St. Laurent project since it was first featured in print several decades ago. Your photos are lovely. What a memorable way to spend your anniversary! We have never been, but would like to. Even more so after reading this. Thanks for a great post. Thank you I hope you make it some day it will be worth it. Morocco is on my bucket list, so I particularly enjoyed your tour of Marrakech. I’d love to make a stop at the Marrakech Henna Art Café and get a little work done. Yes I am regretting not getting henna when we were there….maybe next time enjoy your trip here. Thanks Johanna Marrakech is a definite for the bucket list has lots of variety on offer and not too big a city. 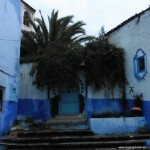 Morocco is on our travel list for this year and your post about Marrakech realy piqued my interest. 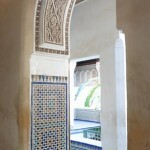 Palace Bahia sounds amazing and the Jemaa-el-Fha square an experience not to be missed! 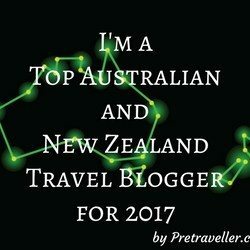 Thanks for the fabulous preview and I’m looking forward to reading more about your travels. Thanks Anita the Square can be quite confronting at first but if you hang back and watch for a while you will find it ok. Your title pulled me in right away. Such a great way to describe what you experienced. I have always felt an affinity to the “Marrakech” style from way back in the hippie days of the 60s, and so enjoyed your post and photos. Last year I spent some time in Grenada, Spain, where the immense Al Hambra looks over the city. The Moorish influence from Africa is present there — to the point I would not be able to distinguish your photos of the Palace Bahia from my pics of Al Hambra! Pretty cool, huh? Thanks Josie we too visited the Al Hambra what an amazing place. We were lucky not to have the same crowds in Palace Bahia, glad to enjoy your post. Sounds like Marrakech is a very interesting place with lots to do if you so choose. 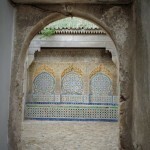 Morocco is on our list of places to visit one day, so we will keep these ideas and tips in mind. I hope you make it here it really has a lot to offer. 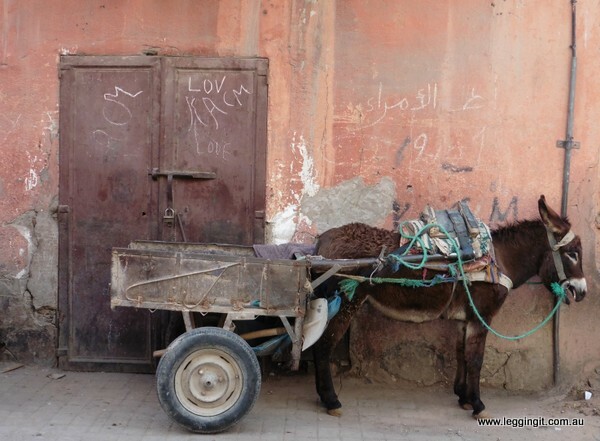 I love Morocco, and appreciate any hints to make the most of a stay in a tourist magnet like Marrakech. One idea for a getaway from the hustle and bustle: take a Grand Taxi or bus to the Atlantic coast, and have a couple of days at the seashore, enjoying fabulous grilled fish and visiting argan oil cooperatives. Lucky you, to celebrate your anniversary in romantic Morocco! We are currently in Essaouira and agree totally. If you were coming to Morocco for a short period of time balancing it out with a few days in both places would be ideal. I’ve also visited some of the places full of Moorish influence in Spain, but I’d love to see some of the places you’ve described. Your tips for how best to enjoy Marrakech are very helpful. 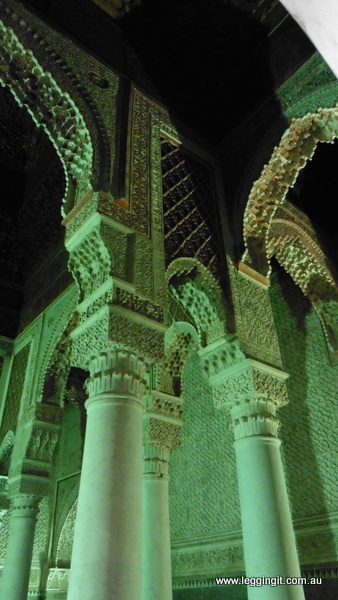 Thank you Suzanne I love the Moorish architecture and have really enjoyed exploring it. We’re looking forward to getting to Marakech! I love Islamic palaces and gardens, so beautiful. And if I ever get to Marrakesh I want to do one of those cookery lessons! 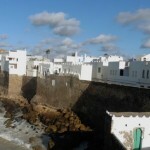 I am booked in for one here in Essaouira on Sunday so looking forward to it. Thanks for sharing your travel tips to Marrakesh. It’s a spot that is on my travel bucket list for my life after 50. Happy Anniversary to you both. Boy has it been that long. Loved what they did with your bed. This part of your journey sounds a lot like Egypt where the vendors would not leave you alone which I found very frustrating. Some amazing buildings and love the tiles. Keep safe and enjoy.